(Aug 4) Italian Academia: A Family Business? It is apparently worse as you move south in Italy. It's pretty bad in Naples and really bad in Palermo. "It" is the unusually high clustering of last names within Italian academic institutions and disciplines indicating, widespread nepotism in the country's schools. This comes from an article by Stefano Allesina, "Measuring Nepotism through Shared Last Names: The Case of Italian Academia" in PLoS ONE, 2011; 6 (8): e21160 DOI: 10.1371/journal.pone.0021160, reported on-line in Science Daily. "In recent years," says the article, "several scandals have hit Italian academia over the hiring of close family members to prominent faculty positions at public universities [including the case of]...the chancellor of Sapienza University in Rome...investigated by an Italian news program after the hiring of his wife, son, and daughter to medical faculty positions." The article looked at the geographic distribution of nepotism across Italy and discovered a north-to-south gradient, with the probability of nepotism increasing as one looked south, peaking on the island of Sicily, "mirroring similar negative statistics such as infant mortality, organized crime, and suicide rate that are higher in southern Italy compared to northern regions...For an Italian, this is not that surprising," said the author. "It is a narrative of two separate countries, where in the public sector we have more problems in the south." (Aug 13) Totò statue removed! Alassio is a town of about 11,000 inhabitants waaaaay up north in the region of Liguria on the last stretch of the Italian Riviera before you pass over into France. The Italian daily, il Mattino, ran a letter this morning from Marco Melgrati, mayor of Alassio from 2001 to 2010. 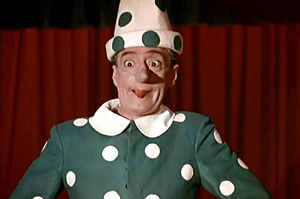 In the letter, the ex-mayor apologized profusely to Liliana De Curtis, daughter of Neapolitan Antonio De Curtis, known to generations of Italians as Totò, the best-loved Italian film comic ever. (As the Romans said, ubi maior minor cessat—roughly: He's in first place and no one is in second and fading fast.) 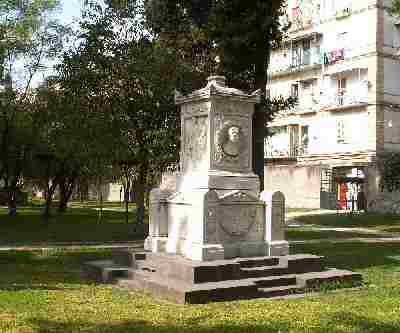 During the Melgrati's tenure, he had a small statue of the great comic erected in Alassio as well as causing a square to be named for him. It seems now that the new mayor, Roberto Avogadro, has had the statue removed and the name of the square changed back. Melgrati says he is quite sure that not even all of the 36% plurality of the voters who put Avogadro in office were for removing Totò, a move that made national news. The new mayor's justification was that Totò was not from Alassio. The old mayor says that it is more about where Totò was from than about where he was not from and that Avogadro is such a rabid anti-southerner that even his friends in the Northern League distance themselves from him. (Aug 13) The Fontanelle cemetery has reopened for visitors. (Aug 13) Cave-in in Casalnuovo. The Undergound Portal has a number of items on the problems of trying to live on top of the many caves and quarries of Naples. (This item is a good intro to the topic.) There has just been another one in the area of Casalnuovo, an area a short distance to the NE of the Capodichino airport. It was huge and literally swallowed a garbage truck, unfortunately claiming the life of the driver. Finger-pointing has been typical—no one answered the constant complaints about the presence of water moving beneath the street; also, general road maintenance has been poor; even worse, there does not seem to be a reliable chart of underground conduits in the area, such as sewer and gas lines. (Aug 13) The world's ugliest mega-yacht has just left Naples. It might also be the world's coolest Bond-villain yacht, if you have such aspirations. It looks like a warship and belongs to Russian billionaire Andrey Melnichenko. "It" is the good ship "A" (that's right, just "A" for Andrey and, maybe, Alexandra, the skipper's Serbian-born wife and glamorous model). Vital stats: length-390 feet (119 meters); price tag- $300 million; launched-2008; builder-Blohm & Voss, Germany. (Vital stats on Alexandra: I have no idea.) The "A" carries a crew of 42, has three swimming pools, a helipad and three 30-foot speedboats. The ship was designed by French product designer Phillipe Stark and is totally enclosed; you don't go topside and sunbathe. Russian billionaires and their Serbian girlfriends are notoriously paranoid. In the time it was here, the "A" was anchored near one of the other "strangest" boats in the world (photo, right): The Maltese Falcon, a so-called "Dynaship"--the automatic sailing ship of the future, with carbon-fiber masts and self-furling sails stored within the masts. The vessel is 88 m (289 ft.) long. I was waiting for them to square off and have at it. Forget Alien vs. Predator; this was going to be the real deal! Laser rays of death shooting out from the evil alien, Malnichenko, while poor Greek Godzillionairess, Elena Ambrosiadou (who paid only a measly 165 million for that raft of hers) fires back with her eco-friendly dyna-balls. Alas, no deal. The Russkie weighed anchor and went off to Capri this morning. Marx, Lenin & Stalin are turning over in their kayaks. "In September 2010 GGYC and BMW Oracle Racing announced that...the 'America's Cup World Series' would be run in various world venues in 2011, 2012, and 2013 before the challenger selection series, defender selection series, and America's Cup Match in the summer or fall of 2013. The 2013 America's Cup match will be held in San Francisco." I remember that in 2003 Naples failed in its bid for the 2007 America's Cup. I now see that the city is jockeying to get the waters of the Bay of Pozzuoli selected as the site of one of the run-up "world venues" in 2012 or 2013. It is a much less ambitious project than the one eight years ago (which entailed building a new boat harbor in Bagnoli), yet this one would be a shot-in-the-arm for the local economy and would dovetail nicely with other grand plans to rejuvenate the area, such as the World Cultures Forum. (Aug 18) The English Cemetery was disgracefully vandalized yesterday! This is the final insult to long-lasting injury, a period of five years of absolute neglect since I put the original entry up in 2006, at which time the premises were still a restored "historical jewel" in the city. (This is where I make my usual complaint about the local approach to urban maintenance, which seems to be, "OK, we built (restored) it; now Jesus will take care of it." My original complaint, from March 2003, is here.) The cemetery had become inaccessible, anyway, and visitors to Naples were aware of that fact (in spite of "must-see" little notes of outdated cheer in their guide books). The severity of the vandalism has led some voices in City Hall to say that it was obviously the work of "the mob" since everyone knows the camorra wants to open a nearby gambling establishment. Presumably —but I don't know how mobsters or people in City Hall think— if you make the area as ugly and undesirable as possible, more people will want to come and gamble. (Aug 30) Calling all ghostbusters! One way to get tourists into your museum is to take a picture of some exhibit or other and have a cute little ghost show up in it and then post it on the internet. That happened in mid-August at the National Museum, and for a while the place was crawling with seekers after the paranormal. The head of the National Library down at the Royal Palace says bemusedly that the cuddly bit of ectoplasm in the photo really belongs to the library! The library itself goes back to 1804 when it was first housed in the very building that now holds the museum. The library was moved in 1927 to the Royal Palace and the poor ghost somehow never made the move. Moving through walls and other dimensions is one thing, says the library director, but getting across town in Naples traffic is something else entirely. Kill-joy unbeliever geeks have noted the availability of an Apple apparition app that might be responsible. 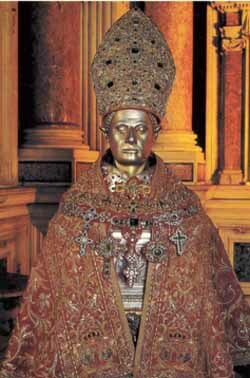 Silver bust of S. Gennaro donated by Charles II of Anjou in 1305, in the Naples cathedral. 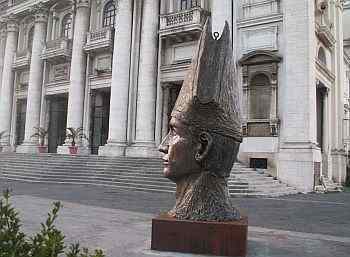 (Sept 7) Speaking of San Gennaro, the city's latest addition to the artistic array of representations of the saint is a 4-meter-high bronze bust installed in front of the Basilica dell' Incoronata del Buon Consiglio, also near the entrance to the Catacombs of San Gennaro on the road up to Capodimonte. It is the largest such work ever dedicated to the patron saint of Naples and is the work of Lello Esposito. It was installed in April of this year. The work is realist and a bit stern due to the penetrating gaze of the deep-set eyes. 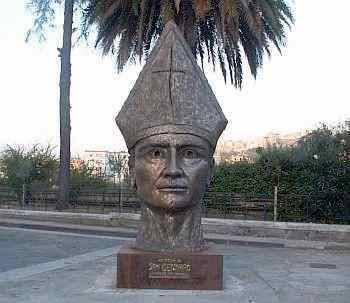 The bust is, in fact, entitled Gli Occhi di San Gennaro–The Eyes of San Gennaro. Espositio, himself, says of his work, "There is a lot of symbolism. The head is set in a position as if guarding the catacombs, the deepest part of the city, the bowels of the city, but it is also set outside on one of the highest parts of the city. Gennaro is looking at us—and over us—the way a father does with his children. He is watching us and taking care of us." Lello Esposito was born in 1957 in the Anticaglia section of Naples, in the heart of the historic center. He has been a sculptor and painter for 30 years and has exhibited internationally since 1990. He focuses on the symbols of Naples—Pulcinella, the egg (from the Egg Castle), the skull (as in the memento mori), Vesuvius, the curved horn, etc. Of his devotion to such symbols, he says, "The city is inside of me—the streets, the language, the music and traditions have made me what I am. I am just trying to pay homage as best I can." (Sept 19) It wasn't even a cliff-hanger. At 09:56 this morning, cardinal Crescenzio Sepe announced to a jam-packed cathedral that the miraculous liquefaction of the blood contained in the vial had transpired before he even got the vial out of the safe. Somebody upstairs is not paying attention to the Italian senate! (See second item above this one). That may require some interpretation way above my pay grade.